Lens Description: The 7.5mm f/3.5 UMC Fisheye MFT Lens from Samyang - Black is the first model in a new series of Samyang lenses designed specifically for the Micro Four Thirds system of cameras. Compact and with superior optics it is compatible with any micro four thirds mount. Providing a 180º angle of view, this lens is ideal for shooting panoramic vistas and for stitching together sweeping full 360º views. It is perfect for exploring the creativity of wide-angle lenses by distorting and exaggerating normal perspectives and with its large depth of field, it\'s a great lens for close-up shots and fun portraits. The built-in petal shaped lens hood provides some protection for the lens but more so, assures that glare and flare stay out of your photographs. 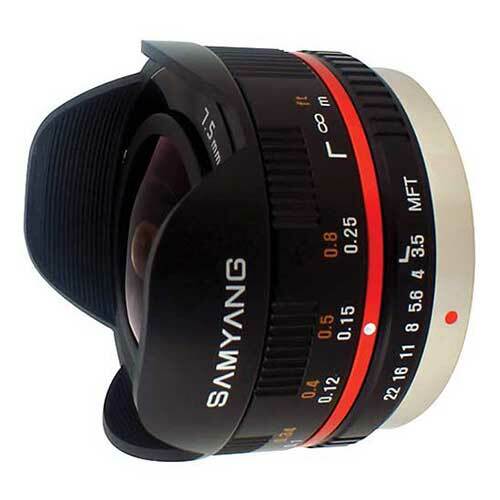 Samyang will be introducing more lenses for micro four thirds cameras, but this simple, affordable lens offers a great option for MFT users to explore their world from a fisheye perspective.